There is simply nowhere the Travel PAL Mini can't go! When rolled, it fits in the palm of your hand, inside your purse or even in your pocket for ultra compact transport. But don't let its size full you...the Mini delivers huge support. Its length and width were carefully designed so it fits snuggly in the small of your back and fills the space between your spine and the seat back. No matter how light you pack, there's always room for the Travel PAL Mini and a whole lot of comfort. The Mini's petite size also makes it the perfect choice for discreet use in public. Say goodbye and good riddance to carrying bulky, embarrassing supports. 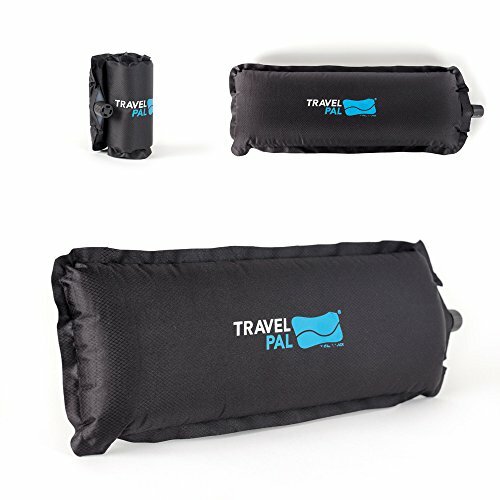 Like all Travel PAL products, the Travel PAL Mini is self-inflating and deflates into a compact, perfect-for-travel size. Inflation can be stopped at any time for a personalized level of support. Adjustable Support: The unique combination of air and foam inside Travel PAL Mini allows you to customize the level of support. It adjusts to your body no matter what seat you're in! Compact Mode: The last thing you need when traveling is extra weight or baggage. Travel PAL Mini is extremely lightweight. About the size of a soda can when deflated. If you have any questions about this product by Healthy Back, contact us by completing and submitting the form below. If you are looking for a specif part number, please include it with your message.